Held at Sunnydale Leisure Centre at 7.45pm. Apologies have been received from Mark Nichol, Helen Rushby, Jo Beckett and Jayne Henderson. MINUTES OF LAST ANNUAL GENERAL MEETING (31st January 2018). Everyone at the meeting had read the minutes of the last AGM. These were agreed as a true record, proposed by Phil Carter ,seconded by Gerry Hehir. ELECTION OF PRESIDENT AND VICE PRESIDENT. Gordon Hope and John Stephenson the current holders were both unanimously re-el ected. Appreciation was shown for the commitment and support they had both given the club during 2018. CHAIRMAN’S REPORT AND ELECTION OF CHAIRMAN. The Chairman was asked to read out the report to the meeting and the chairman confirmed that the full report and had been included in the latest Crook Ed and is also available on the club website. There were no issues in the report some of the comments would be discussed later in the meeting. Graham Laverick was unanimously re-elected as Chairman. A question was raised about the role and Graham Laverick stated that some of the traditional tasks a secretary would undertake. This is the 4th year in the role and Graham confirmed that provided a number of other members in the club were prepared to continue with assistance he would be prepared to continue in the absence of anyone else coming forward. TREASURERS ANNUAL REORT & ELECTION OF TREASURER. Harry Binyon went through the Statement of Accounts and answered questions. The main focus was the race entries showing a deficit of £223.30. This can be from either 2 sources the relay events the club enters or the XC events the club pays and then expects the individuals to pay for. Agreed that clarification is needed and going forward no entry fee paid then no entry. This to be discussed at the next committee meeting. The balance at the beginning of the year was £5670.12. The balance at the end of the year was (31stDec) was £7919.60. The club has faced increased costs for the use of the facilities at Shildon and the club was grateful for the grant received from Durham County Council for the relocation from Crook. As we continue to attract new members to the club the cost is just about met by the £2 weekly fee paid by the members to use the facility. The statement of account was agreed , proposed by Jane Henderson and seconded by Alan Welsh. A copy is attached to the minutes. The current Treasurer Harry Binyon was thanked for his work during 2018 and re-elected for yet another year although this year he did say it is his final year! The club had operated with no “official” captain for 2018.The secretary confirmed that no one had come forward as asked if anyone was prepared to stand. Gerry Hehir thought and expressed his views that the club needed someone to act as the vocal leader. Consideration to be given during 2019 about the possibility of the club appointing an overall captain for both male and female. The club had last year appointed a number of vice captains for various roles and all were prepared to continue. Matthew Hargreaves will continue in the role of editor of Crook Ed. Paul Brennan will continue with responsibility for the relays and the Harrier LeagueXC. Geoff Hewitson will continue on the NEMAA activities. All were thanked for their hard work during 2018. Geoff said that Rob Teasddale was now prepared to take on more responsibilities and it was agreed unanimously that Rob to be elected as a vice captain. There had been no other nominations for the role and Joanne Raine was re-elected. ELECTION OF LADIES VICE CAPTAIN. There had been no other nominations and Jane Henderson agreed to continue as vice-captain with specific responsibility for the NEMAA events. The secretary confirmed that there were no formal nominations and confirmed that a number of members make valuable contributions without actually been on the committee and asked if anyone was prepared to volunteer. Graham Laverick, Harry Binyon, Geoff Hewitson,Paul Brennan,Matthew Hargreaves, Joanne Raine, Jane Henderson. And the following other members to serve on the committee Phil Carter, Rob Teasdale, Helen Rushby, Martin Harbisher. Alan Welsh and Colin Everson to act as co-ordinators with the junior section. After discussion Steve Blacklock and Sharon Bridge agreed to serve on the committee for 2019. The secretary explained that the England Athletics individual fee remained the same at £15 but the club affiliation fee had increased to £150. Competing members will be £35 if paid before the 31st March 2019. After this date the fee increases to £75 for existing members. The secretary explainer the philosophy behind this as the club wanted to sort out the fees to EA as soon as possible after the 31st March to ensure all the members are able to compete and to obtain discounts for races. Non competing members will be £30 for the year. Social members will be £20. Competing members over the age of 65 with 10 years membership will pay £30 for the full year if paid before the 31st March. Juniors under 18,anyone in full time employment and anyone unemployed will pay £20 before the 31st March. NO FAMILY DISCOUNTS WILL APPLY as the Junior section have their own fee structure in place. The cost of each session at Shildon on a Tuesday evening will be £2. However a small number did purchase an annual licence and it was proposed that this should continue the cost will be £90. This is an increase from the 2018 as the club handicap each month takes place on the track. It would help greatly if payments could be made directly into the club bank account with a reference of your name and initial. Alternatively payment can be made directly to Harry Binyon by cash. A number of items were discussed. Colin Everson reported on the work he was doing with regards representing the junior section. Likely that the C.D.A.N. affiliation fee is likely to rise from £40 to £50 in the coming financial year. In view of the number of youngsters taking part and the cost for example of an official course which will be reclaimed it was agreed that our membership will continue. The juniors will have a combined team with Derwentside for 2019. Safeguarding needs to be up dated for example references to CRB need changing agreed that this will be actioned. There was an up date on the facilities at Shildon and a number of promising meetings over the last few months have taken place all of which have been positive. EA are keen to lend their support and in particular the restoration of the throwing cage which would significantly increase the profile of the facilities. Concern was raised about the lack of a noticeboard, however the club does have a board in the changing facilities which are currently out of use for the males in the foyer. The foyer is still open the problem is that many members never used the changing facilities agreed to see if a board can be placed in the Leisure Centre. 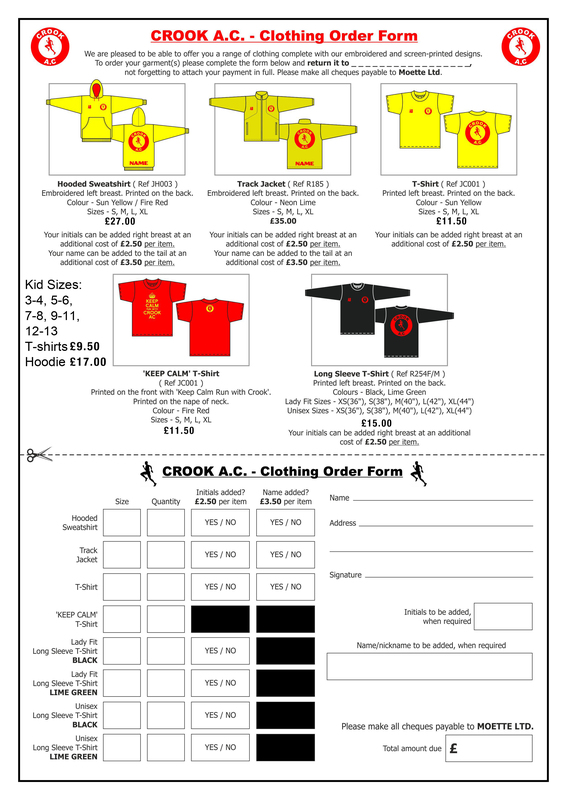 Geoff Hewitson proposed that to encourage new members to join the club and take part in events that they receive a discount of £10 of their first club vest. This was unanimously agreed by the members. The secretary proposed that from 2020 that on acceptance of the London Marathon place the lucky winner should be co opted to the committee for that year and also asked to make a monthly contribution to Crook Ed on how their training is going. The secretary thanked Simon Fell for chairing the meeting as there were no further points the meeting closed at 9.00pm.